The Economics Department is known for its intellectual calibre. It has a competent faculty known for its dedication and experience. The Department offers courses in Economics which provide an in depth understanding ofthe working of economies of different countries ofthe world. The Economics Society organised The Fourth Annual Economics Symposium of the department in March, 2015, flagged off by the inaugural lecture on ‘Indian Economy and the challenge of Human Development’ by Prof. Halima Sadia Rizvi, Dept. of Economics, Jamia Millia Islamia. The lecture was followed by a poster-making competition on the theme, ‘Poverty, Inequality and the great Indian Dream’ followed by other events including Inter-College Quiz, Debate on the theme ‘Budget 2015: Making the rich, richer’, and Essay Writing on ‘Inclusive Development for 1.25 billion’. 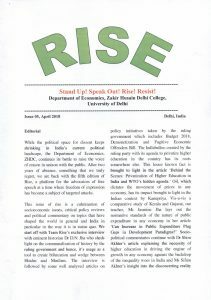 The Fourth issue of the Department’s Annual Journal ‘Rise’ was released in the Symposium, along with the journal’s online version. The Society is also organizing a field-trip for selected members of the Journal’s editorial board to Pahalgam, Kashmir, for a seminar on ‘Women and Education’. The Society also takes pride in the selection of our student, Sukriti Hatgaonkar for presenting a paper entitled, ‘Empowering Indian Women through Self Help Groups’ in a Seminar on ‘Gender and Livelihood: Opportunities and challenges’, organised by Barkatullah University, Bhopal.